Victoria Beckham landed in Napa on Friday to attend manager Simon Fuller's wedding this weekend. You will be surprised to see that Victoria is NOT, I repeat not wearing heels. This is the second time in a week the she has been seen without heels. But I don't see this trend lasting for long, as our girl loves heels, the higher the better. All the other ex-Spice Girls travelled to Napa, so it will be another mini reunion. David Beckham has been named the captain for tomorrows friendly against Trinidad & Tobago. It will be the first time that he has worn the armband since the 2006 World Cup, when David resigned as captain of the team. Capello has rotated the captaincy during a series of friendlies, and will make a final decision about who will be the permanent leader, before the next World Cup qualifying series gets under way. "People will always question whether I can still play at this level but I want to carry on. I am not ready to stop playing for my country," said Beckham. "I have a few more wrinkles now but I still feel I can do what I did 10 years ago. I was happy with my performance against France in March, my first game under Fabio Capello, and it was the same against the United States the other night. I was happy to set up the opening goal." "When you have worked on things during the week, like where the players have to run to and where I have to put the ball to, and it comes off in a game, it makes you happy. People have always talked about my set pieces and what I can bring to the team. I can bring a lot more to the team than set pieces but it is one of my strongest things that I can do in the game. There is always a chance if I get a set piece that I'll put it in the right place for someone to score." "The manager has said if I stay fit and I am performing, then I've got a chance to be in the squad and that's all I can ask for. At the moment I am taking each game as it comes - and who knows what is around the corner? But I've played in three World Cups and I know how much it means to the country, so I would love to still be playing in 2010 and be at the World Cup in South Africa." David Beckham helped to attract around 3,000 fans to England’s practice session ahead of Sunday’s friendly match against Trinidad and Tobago. Many fans cheered every time the Los Angeles Galaxy star touched the ball Friday at Hasely Crawford Stadium. The 80-minute light workout involved jogging, skills drills and a game of two-touch soccer. England players applauded the crowd for their support at the end. England coach Fabio Capello is resting seven of the Manchester United and Chelsea players who played in last week’s Champions League final. David Beckham played football with school kids at the Marvin Lee Stadium in Port Of Spain, Trinidad after his training session. He even took the time to tie one kids sneakers. Victoria Beckham continues her love affair with Marc Jacobs. She wore this yellow dress from Marc Jacobs Resort 2008 collection this week, when she went to lunch with friends. Her matchy yellow tote is also by Marc Jacobs, which was spotted by Posh Lover. 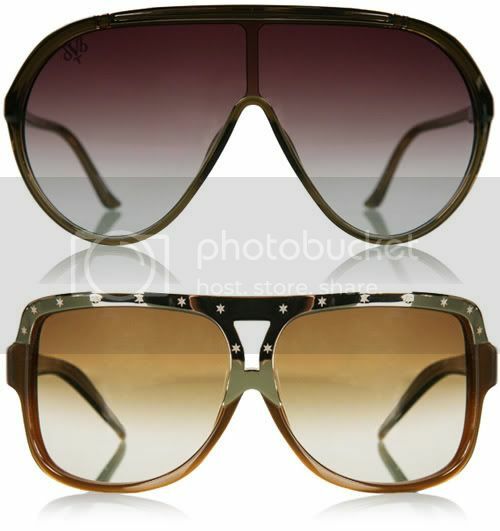 I think someone has already mentioned in the comments, but I found these dVb sunglasses on My-Wardrobe.com a few days ago, and was waiting for a slow news day to post the information. 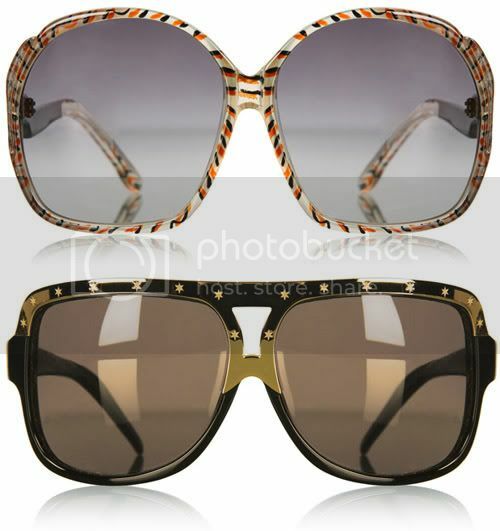 All the sunglasses retail at £165 and are branded either with the dVb logo, stars. I love the starred aviators above. David and the England Football Team flew to the Caribbean this morning, so Victoria Beckham has been doing her best to keep busy in LA. Wearing a bright yellow dress and a matching handbag, she was spotted arriving to Shutter’s on the Beach in Santa Monica for lunch on Thursday. Either it is the sun or her hair gets lighter every time I see new candids. I keep reading that Victoria will be auctioning off her Spice Girls outfits, but until actually happens I will not believe the story. The reason being, I have read many interviews were she has stated that she keeps everything in storage. But maybe as her days as a Spice Girl are well and truly over, she wants to clean out her closet. I personally would keep that kind of stuff for ever. Victoria Beckham will attend Monday night's CFDA Fashion Awards. This year, the Womenswear Designer of the Year award will be presented jointly by Victoria Beckham, Eva Mendes and Maggie Gyllenhaal, who will take the stage representing nominees Marc Jacobs, Francisco Costa for Calvin Klein Collection and Jack McCollough and Lazaro Hernandez for Proenza Schouler, respectively. This will mean we will hopefully some great pictures of Victoria wearing Marc Jacobs, of course. These new pictures are of Victoria out shopping at the Grove with her niece. Last night a very proud David Beckham put on his England kit for the 101st time. Before the game a beaming David Beckham was presented with a his Golden Cap from Sir Bobby Charlton. The cap was in a glass case, with every game he played in engraved on the case. It really was a beautiful touch. David Beckham is doing his best to dazzle American soccer fans with his precision free kicks. He also is making sure they don't forget about them back in England. Beckham's perfect curling ball set up John Terry for the go-ahead goal in the 38th minute, and England ended up winning the game by 2-0 at Wembley. While England may not have been good enough to qualify for the 16-team European Championship next month, they did not struggle against the Americans on the world's most famous soccer field. Steven Gerrard scored the second goal in the 59th minute off a through-ball from Gareth Barry that exposed the US defence. Landon Donovan, Beckham's teammate, missed out on a chance to become the fourth-youngest player with 100 international appearances. The 26-year-old didn't dress because of a tight groin. "I'm more disappointed with the result. But yeah, it would have been nice," Donovan said. I am sure it would have been a very different game had Donovan been fit to play. The match drew 71,233 to Wembley, the lowest figure in any of England's eight games at the 90,000-capacity arena. 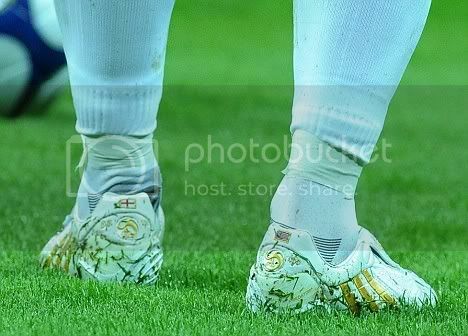 David wore a pair of commemorative boots with England and USA flags embroidered on them. Click on the picture to see David's post match interview. Is Victoria Beckham Returning To Ugly Betty? Victoria Beckham To Attend The SATC Premiere? Who Wore What Comes Around Goes Around Better?